Brand: Fire Lite , Morle , Ravel, GST , etc. making them easy to expand. We are a most trusted name in between the topmost companies in this domain, instrumental in offering finely finished Wall Mounted Fire Alarm System. Our company is highly rated in the field of offering Fire Alarm System to the clients. This product is widely finding valuable applications in various industrial sectors. Fire Alarm System is manufactured by using latest technology and tools according to the set industrial standards under the guidance of professionals. 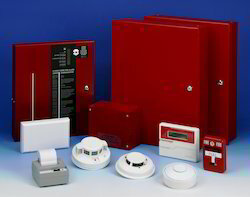 Backed by our state-of-art infrastructure unit we are putting across quality range of Fire Alarm System. It is available in compact size and can be bought in standard specifications. We are dedicatedly involved in providing an excellent quality array of Fire Alarm Security System, for catering the various needs of our clients. A fire alarm system is number of devices working together to detect and alert people through visual and audio appliances when smoke/fire is present. 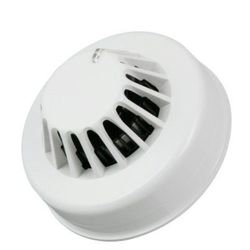 These alarms may be activated from smoke detectors, heat detectors, water flow systems, which are automatic or from a manual fire alarm pull station. We offer LifeSOS/FFAS IP Based Fire Alarm System, with AC meter, Smoke/Gas/Flood/Temperature Detectors and Voice Warning/Auto Control Switches, the fire can be located and put off in its earliest stage. Rajesh Industrial Projects Pvt. Ltd.